Inspectors from Ankara’s Provincial Directorate for National Education have recently completed their report on the Gezi Park demonstrations. 46 school principles and vice-principles are to be removed from their posts for “not penalising students who took part in the Gezi Protests” and “overlooking students taking part in the protests”. The Directorate said that it would consult with the local offices before it passed judgement. Realistically though, this means that it is a done deal. It should be reminded that the Metropolitan Education Office had started investigations into hundreds of teachers for abetting or overlooking students who took part in the protests, in Ankara as well as elsewhere. During the investigations the police had reportedly shown Police recorded footage to teachers/principles and asked if any of the protesters were students at their institution. Moreover, student/teacher social network feeds were also analysed. Now that the sentences for principles have been given, a similar process is underway to skim out teachers who have been in support of protests or uncooperative with the authorities in terms of the Gezi Protests. 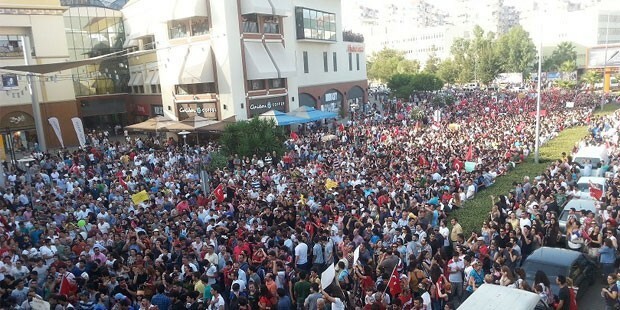 Is Ankara’s ODTÜ becoming Istanbul’s Gezi: “Everywhere is ODTU, everywhere is resistance! The international media has turned its gazing eye away from Turkey after the street battles ignited over the demolition of Gezi Park gradually died out. 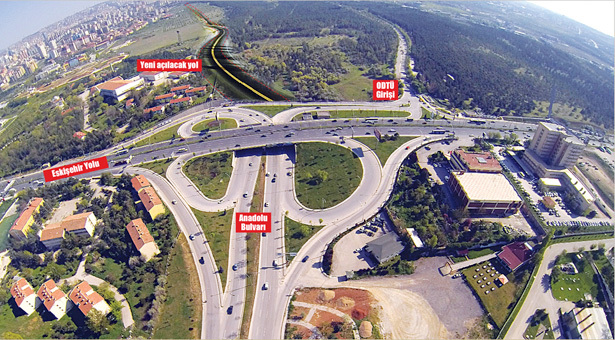 Since late August however, the proposed construction of a motorway in Ankara that runs roughly parallel to the ODTÜ (Middle East Technical University) campus – partially through its forests – and two residential neighbourhoods has provoked similar reactions from communities not only in Ankara, but also worried citizens in other urban centres including but not limited to Istanbul and Izmir. The resemblance between what happened in Gezi Park and what is now happening in Ankara is worryingly close. On this note, EU’s envoy to Turkey has also voiced concerns that “some people have not learned their lessons”. It is important to stress that the Gezi Park demonstrations garnered its initial support due to the illegal nature of the construction. Constructions in the Park had started before a legal warrant had been obtained. Similarly, the motorway project that runs through two neighbourhoods and a forest within ODTÜ grounds that constitutes an environmental protection site can not go ahead before the Environmental Protection Council and the Archeological Preservation Council provide a report to the Ministry, the Council of State approve the construction, and the legal appeals are finalised by the courts. Although this process has not been finalised, the construction work is well under way amidst strong opposition. In both cases, it is the attitude of the authorities, their complete disregard for formal and legally binding ways of conduct, their vitriolic disapproval of reasonable dissent that is causing such deep resentment. In short, the local municipalities are acting as if they are above the law. For many years now, Ankara’s Governor Melih Gökçek has commented on occasion about his desire to construct a road through the ODTÜ campus. This plan was finally announced and it became clear that the Ankara municipality would be constructing a motorway that runs along the ODTU university campus and actually through the 100. Yıl and Çiğdem neighbourhoods. This project was announced in mid/late August and immediately provoked dissent from the residents of the two neighbourhoods affected and students of ODTÜ university. In response to the motorway project, residents of the neighbourhoods and ODTÜ students started holding protests in late August. Right next to the ongoing construction site, tents were erected and protest were organised by the 100. Yıl Initiative, the Çayyolu Üç Fidan Park Forum and the Anıtpark Forum, mainly constituting ODTÜ students. The protests have intensified since Sept. 6. The police’s repeated interventions into protests with water cannons and tear gas has also stirred supporting protests across the country over the past few weeks. On the other hand, students and activists have been resisting the police, often using fireworks in response to tear gas. Its worth pointing out that the motorway construction is a separate issue to the proposed construction of another road that actually cuts right across (East-West) ODTÜ grounds. The motorway project is one that builds a road between Anadolu Boulevard and the Konya Highway on the North-East corner of the campus. The road project was given the go-ahead by the university’s administration despite ODTÜ’s forest being a declared “SİT” area, meaning that it is a protected site where construction is forbidden, following a Ministry of Culture ruling in 1995. However, the university had no alternative in the matter since the road has been a part of the zonal planning documents that go back over 20 years and are binding. ODTÜ said the ministry notified the university about the modified redevelopment plan on Oct. 11 and the university administration told authorities not to act to implement the plan because ODTÜ had some reservations about the modified plan. ODTÜ said they had one month to object to the proposed plan and Ankara Metropolitan Municipality officials assured the university that they would not act before receiving the university’s objections. Although such assurances were given, road construction teams and heavy duty machines entered the ODTÜ campus around 10 p.m. on the night of Oct. 18, the last day of the Feast of Sacrifice. Around 3000 trees were hacked down by construction workers under the protection of police whilst the sudden start of the road construction triggered a protest as demonstrators gathered via social media calls. Although officials claim that 600 pine trees were repotted elsewhere, it doesn’t take a botanist to deduce that such statements are a last ditch attempt at saving face. In response to the violation of ODTÜ campus, the Rector’s office has published a statement which details exactly how the Ankara Metropolitan Municipality have disregarded the rule of law and state that they are pressing charges. The construction work within the ODTÜ campus started on October 18th, but parts of the road that are outside university grounds have been ongoing since late August. On October 21, a group of students and residents who opposed the uprooting of trees went and repotted saplings where the road was being constructed. In response to the protests, the construction worker thugs attacked the protesters. Police were late on the scene.. In a written statement, (link in turkish) the inhabitants of 100. Yıl and Çiğden stressed their opposition to the project. The road that is being built is an 8 lane highway that is expected to carry 40,000 vehicles daily. Of this road, 4km runs directly through the neighbourhoods of 100. Yıl and Çiğdem. The residents are rightfully worried of air and noise pollution. They demand that the potential damages such a motorway would have on their health to be researched before the construction gets underway. Secondly, the statement makes specific objection to the pontifical attitude of the municipality. The municipal authority sees a city plagued by traffic congestion. Their solution is the construction of a new road. Their way of actualising the project however is deeply flawed. Not only is the municipality not consulting those who will be most affected by the construction, they are also acting out of accordance with the due-process-of-law: the construction has not waited for the approval from councils or for the legal appeals to be heard. In terms of entering ODTÜ by force, the Rector’s Office has stated that the forced entry into private property is also a breach of their rights. Apart from the grievances of the residents, the ODTÜ foot of the project has caused opposition from the university due to environmental concerns. ODTÜ’s leafy campus is one of the greenest areas of Ankara and has become an oasis of trees in recent years, after a construction boom in the surrounding area that also increased the traffic volume. The road project requires the destruction of around 3,000 trees, not to mention that about 400m of the proposed road comprises an environmental protection site (SİT), which holds precedence over zoning plans for infrastructure constructions. In short, the 1995 decision declaring the forests a protected site overrules the 1994 zonal planning documents which draw planning for a road through the forest. This is legally binding under laws 2863 and 5226. Symbolically, what drives the attitude of the authorities home is their choice in uprooting the trees and starting its construction works in the dead of night only hours after the national holiday had technically ended. The fact that ODTÜ were not informed of the plan to enter their property for construction work is also seen to be in bad faith. The tension between the authorities and the communities are greatly exacerbated at every turn due to the provocative attitude of the municipality and governor Melih Gökçek in specific. For example, Gökçek had targeted academics at ODTÜ stating, “200 trees will be relocated. Some agitators are goading the masses. According to the incriminating evidence given to us, these agitators are Prof. Ali Gökmen from ODTÜ’s Department of Chemistry and his wife”. In a press statement made on September 30, PM Erdoğan disclosed the long awaited package of reforms addressing democratic concerns. Discussions on which areas of democratic governance would be strengthened via the package and which issues might be left out has occupied the domestic agenda for quite some time. To facilitate meaningful democratic reforms that allow for democratic reflexes to grow roots, it is not enough to amend a bunch of laws that are current practise in democratic governance. Internalising its underlying ethos is as important as the formal changes. Unfortunately, reading between the lines and contextualising issues that are included/excluded, the timing of the package, and the way in which the package was drafted and launched highlights once again that although ‘deepening democracy’ has always been an important part of the AKP’s pragmatist political campaign, the AKP’s paternal instincts and its fondness for authoritarian governance remain as strong as ever. Who is the democratic package intended for? In general, the proposed amendments show that the guiding mindset in the writing of the package has been preoccupied with the Kurdish Peace Process. To bring readers up to date, in the last round of peace talks between the government and the PKK (March 21), the action plan was drafted as a ‘three tier process’. In the first instance, the PKK were expected to withdraw from Turkish territories. Secondly, a process of democratisation where the Turkish state would concede much required fundamental rights and freedoms vis-a-vis the nation’s Kurdish population would be implemented via legal amendments. The third and final step would be a normalisation of relations. Recently, the peace talks were branded as a dead end street due to frustrations on both sides. While the government criticised the PKK for not sticking to its end of the bargain, PKK withdrawal brought things to a halt on September 9 on the basis that the government was dragging its feet in implementing democratic reforms. The agreed deadline for the reform package was indeed September 1. The construction and fortification of military outposts in hostile eastern provinces in June was another issue that the PKK saw as a betrayal on the part of the government. Hence, the package announced on Monday is primarily an attempt to pull back on track a derailed peace process and a statement on the part of the government that it is committed to the peace accords. Furthermore, the protests that raged throughout the summer months across Turkey – reports state that protests were held in 79 cities out of 81 – were embraced by a multitude of identities encapsulating Alevis, Anti-Capitalist Muslims, Armenians, Kurds, Nationalists, Seculars and LGBT activists alike, with the overarching demand of more democracy and more freedom. As such, this democratic package should also be seen as a response to the demands of the Gezi Movement. In short, the unveiling of this democratic package was unavoidable on both counts: prolonging its announcement any longer would have amounted to political suicide. Undoubtedly, there will be those who find the package satisfactory. Deputy PM Bülent Arınç is of the opinion that ‘75%’ of the population is satisfied. It must also be stated that any expansion of democratic avenues is a beneficial development and there are many provisions in the package that expand on democratic governance in areas of political rights and fundamental rights and freedoms. The amendment that lifts the ban on headscarves in all public institutions apart for the army, police and judiciary is a positive democratic reform. The creation of a cultural institute and language courses for Roma Communities is a very progressive step, even if it is only a beginning. The re-instatement of the Mor Gabriel Monastery to the Assyrian Community is another example of a positive step taken to safeguard the human rights of minorities. However, the BDP (Kurdish political party) have already stated that the democracy package is inadequate in terms of the expansion of rights and freedoms for Kurds. As far as they are concerned, the proposed changes are mere breadcrumbs and don’t tackle root problems. Education in the mother tongue, reduced to private schools only, is not a large enough step forward, given that the AKP had already allowed for private language schools to teach Kurdish through legal amendments in 2002. More importantly, although part of the package allows villages, though not districts or provinces, to be re-named with their Kurdish names, and Kurds will be able to procure ID cards with more accurate spelling of their proper names, the ongoing insistence on a highly centralised political system turns a deaf ear to Kurdish demands for local governance. Essentially the centralist, controlling mindset of Turkish rule remains intact. And of course the largest shortcoming for the Kurdish cause has been the lack of reform of a Turkish Penal Code that has put thousands of Kurdish activists behind bars (the KCK trials). Similarly, through discussions on social network sites, it would appear that the sections of Turkish society who were active during the Gezi Demonstrations and who have also been calling for an expansion of individual rights and freedom, are equally dissatisfied. During his long preamble, Erdoğan states that “The attitude that turns a deaf ear to the needs, demands and cries of citizens, but which absorbs them without trace is gone. There is no longer a government that exerts authority in public, or one that turns public spaces into a living hell against citizens who don’t act according the government’s definition of correctness”. This statement could also be turned on its head to describe the reception of some of the AKP’s conservative policies among the public eg. issues around alcohol restrictions and abortion rights – key provocations behind the recent waves of protests. At face value, the provisions that strengthen the protection of individual life-styles and discrimination from hate speech are also positive but they contain hidden dangers. Hate speech should never be allowed, but if the amendment is used as a legal platform to punish undesired criticisms, then freedom of expression will suffer even more. I highlight this as a danger because recently, there have been a number of cases where individuals have been persecuted for hate speech under the rubric of desecrating religious values. On the other hand, life-styles that are deemed ‘inappropriate’ by individuals with hardline religious beliefs are openly discussed as such on state channels and private channels alike, without triggering a response from the courts. In particular there was no mention of hate speech and crimes against members of the LGBT community. One of the largest shortcomings of the package is in relation to a lack of provisions that relate to the demands of the Alevi (Shiite) community towards claiming the same rights as other citizens. The Alevis demand the right to have their spaces of prayer (Cemevi) officially recognised. They also reject compulsory courses on religion (exclusively Sunni), administered by the exclusively Sunni Directorate of Religious Affairs. There was no movement on any of these points. The only amendment in relation to the Alevi Community was the thoroughly cosmetic change in the name of one University, this after all the bragging about naming the third bridge in Istanbul after an ancestor who massacred Alevis. – The issue of the ‘Special Authority Courts’ was ignored. – No amnesty was given to political prisoners that include political activists, journalists and MPs and long detention periods were not responded to. – Obstacles to the democratisation of politics inherent in the Turkish Penal Code, the Anti-Terror Law or the Law on Police Duties and Powers were not addressed. – Limitations placed on local governance mechanisms which are part of international accords were not lifted. – Although the Assyrian Church reclaimed the Mor Gabrial Monastery, the Ecumenical Orthodox Church and the Halki Seminary were left out. 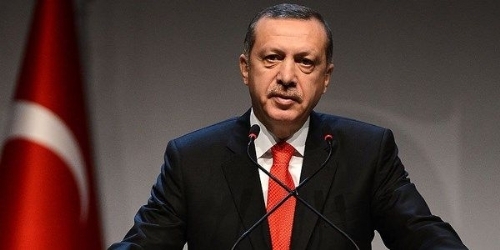 PM Erdoğan’s press conference intended to unveil this democracy package lasted 67 minutes, of which 44 were targeted against the opposition party, the ‘non-democrats’ and any potential future criticisms against the package. Not only were journalists not allowed to ask questions, but journalists who the government sees as critical to its party were not even invited. This in its own way is as important an indicator to the true health of democracy in Turkey: the presentation of the package is as important as the contents. The message one gets is that however much Turkey democratises, the choice of areas selected for democratisation is at the mercy of Prime Minister Erdoğan. After all, another criticism levelled against the preparation of the package was the lack of consultation with different parts of society, which received a dismissal en passant from Erdoğan – pre-emptively – who said during his speech that from, “ those afraid of change, innovation and high standards” he only expected “denigration along the lines of the ‘mountain having given birth to a molehill’”. The PM also made it clear that he wasn’t seeking the backing of the opposition. On the contrary, he once again deliberately placed the CHP in the crosshairs. In short, the package falls short of addressing the central demands of the Kurds and Alevis and is therefore unlikely to reduce tensions and create the conditions for societal peace. Similarly, by not tackling the underlying illiberal and undemocratic governance traditions, those who have been demonstrating against the government with clear and explicit demands, are not likely to be impressed either. Not all is bad though. I think it is important not to underestimate the fact that this is the first time a reform package has been published without the pressure of outside forces. The meaning and significance of this is great because it throws the spotlight on a deep-rooted societal demand for democratic reform which is not going to go away.